An easy step-by-step recipe for Italian Pasta Veggie Salad Recipe, Healthy Pasta Recipe, Quick Italian Pasta Recipe, Free Italian Pasta Veggie Salad Recipe, Best Italian Recipes, Easy Pasta Recipes, Yummy Italian Pasta Veggie Salad Recipe, Best Multicuisine Recipes. You no longer need to visit an Italian restaurant for relishing the tempting Italian Pasta Veggie Salad. 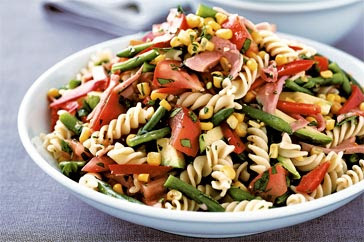 Our tried and tested Italian Pasta Veggie Salad Recipe can be made easily at home. Rest assure, you and your family will keep asking for more after tasting your home made Italian Pasta Veggie Salad. · Cook pasta in boiled salted water until the pasta is soft. Then, rinse the pasta under cold water and drain. · Take a large bowl and combine the pasta, bell pepper, onion, tomatoes and mushrooms. · Now, pour enough dressing over the pasta to coat and toss. Then, refrigerate until chilled.